What if 'Gandhi' was refashioned in 2016 ? 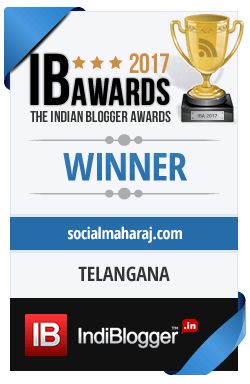 Home / Opinion & Views / What if ‘Gandhi’ was refashioned in 2016 ? What if Gandhi was Refashioned in 2016 ? With Independence day around the corner, you will see Indian flags crop up in every nook and corner of the city. From grocery stores and hypermarkets to traffic Signals and footpaths, it’s that time of the year when the entire city is painted in saffron white and green. For movie buffs and couch potatoes, television channels have a lot in store for you. Patriotic movies and songs are all over the TV and even most of the TV shows align their story to mark the occasion. I’m no movie buff, but I enjoy social-political movies and no prizes for guessing who my favorite director is ! (Hint: Prakash Jha) Out of the various movies based on freedom and patriotism, the one movie that comes to my mind instantly is Gandhi. The movie, released way back in 1982 won much appreciation from the film fraternity as well as the masses. And this was evident as Gandhi swept its way at the 55th Academy Award winning as many as 8 awards including Best picture. It was one of the most iconic films of all time. The movie portrayed how simplicity and power collectivism through acts of non violence can bring the entire British empire to its knees. So what better than celebrating this Independence Day by watching Gandhi on Zee Classic this Saturday on 13th August at 8PM and on Monday 15th August at 9:30AM. We all are aware of the ‘remake‘ ideology of Bollywood. Many famous movies have been remade to recreate the magic, however many have failed to do so. 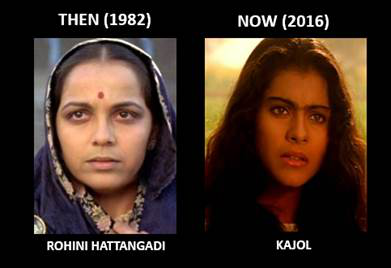 On the other hand there have been many hits too with the likes of Devdas, Don and Agneepath to name a few. So I’m wondering what if Gandhi was remade ? Who would be the cast of Gandhi was remade ? Well here’s my pick of some of the important roles from the movie. Aamir Khan for the role of Bapu. Starting with the lead role of Bapu, who was portrayed by Sir Ben Kingsley on the silver screen in 1982. I would definitely approach the Perfectionist – Aamir Khan. Aamir is probably the only actor who I feel can do justice to this role with perfection. 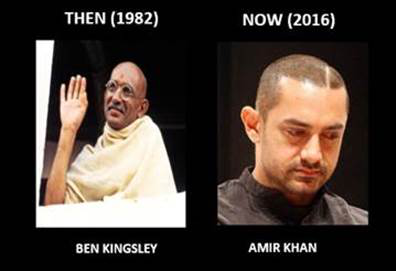 Along with his chameleon skills to adapt to any character along with the attention to details, I feel Aamir can perfectly play the role of Mahatma Gandhi if Gandhi was remade. For the role of Kasturba Gandhi, which was previously played by Rohini Hoattangadi, Kajol can easily pull off the role being one of India’s most acclaimed actresses. 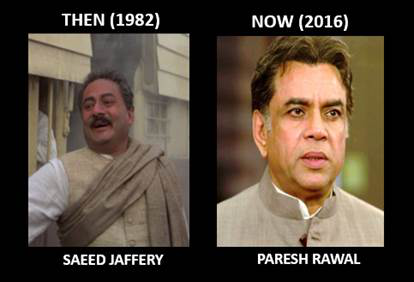 Sardar Patel‘s role that was played by Saeed Jaffrey can be pulled of by the Iron man of Bollywood Paresh Rawal who is known for his diverse character roles. The Gujarati theater artist, Paresh Rawal has everything that it takes to portray as Sardar on the silver screen. Chacha Nehru as he is know, Jawahar Lal Nehru was an integral part of India’s Independence. His part was played by Roshan Seth. 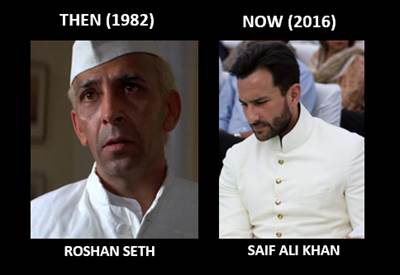 For a remake of Gandhi, none other than our very own Pataudi Prince, Saif Ali Khan can very well pull off this role with his charming royal looks. Mohammad Ali Jinnah was played by Alyque Padamsee in 1982. 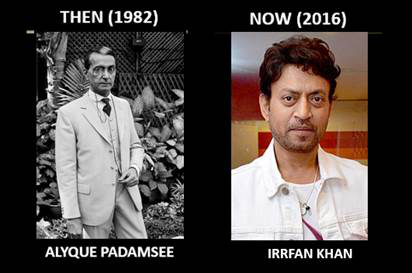 If Gandhi was remade in 2016, Irrfan Khan would be the best man to portray the role of Mohammad Ali Jinnah. With his ability to act with less emphasis on dialogues, Irrfan can play the role of Jinnah. Lord Mountbatten played a crucial role in India’s partition. His role was played by Peter Harlowe in the original Gandhi. 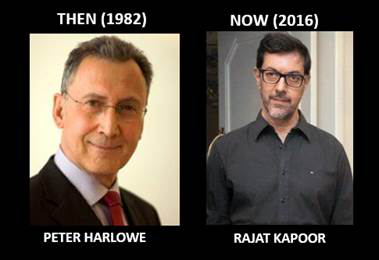 If there were a remake, Rajat Kapoor could be a great choice to play the last viceroy of the British Indian Empire. Gowarikar for the post of director. Now going behind the camera, the only director who can pull this one off if Gandhi was remade is the ace director Ashutosh Gowarikar. Gowarikar is known for his love for historical films. He has the ability to bring back the lost eras to life with movies like Lagaan, Jodha Akbar and Swadesh. With such perfection, Gowarikar can surely recreate the magic of Gandhi once again on the silver screen. 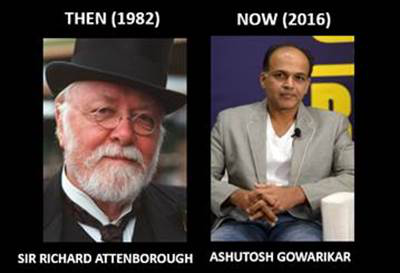 So these were our cast if Gandhi was refashioned in 2016. There might many other eligible actors who could have taken the spot, but I guess these were the most suitable. Think somebody else could play a better part ? Let us know in the comments ! Also don’t forget to tune into Zee Classic on Saturday 8PM and Monday 9:30 AM. Previous Why Indians choke on the big stage ? That would have been nice too ! Thanks for the visit, I’ll ensure to get rid of the inappropriate things.